Guildford had always had much to do with soldiers. It lay on the route between London and Portsmouth. It was the usual stopping place for all kinds of travelers when the fastest speed attainable was that of a horse. Its inns had been requisitioned for the billeting of troops since the 17th century. It had then accommodation for 124 men and 129 horses, a number only surpassed in Surrey by Kingston and Farnham. This burden was always unpopular with the innkeepers, for they got small pay from the army and their more lucrative civilian customers were crowded out. About 1779 during the War of American Independence the innkeepers became so desperate that they made an appeal to Guildford's two Members of Parliament to urge the erection of barracks. The Red Lion and Bull's Head. The Representation of the Inhabitants of the Town and Borough of Guildford. To the Rt. Hon. George Lord Onslow High Steward and the Rt. Hon. Sir Fletcher Norton Kt, and George Onslow Esquire, Representatives of the same Borough in Parliament. "We the Inhabitants ..... humbly beg leave to recommend to your consideration the particular situation of the said Town and the Burdens which are daily brought upon the same by the numbers of Soldiers, Marines and Sailors which are continually quartered therein owing to the Necessity of the present times and which are become so exceedingly heavy that if some relief is not found out the Publicans must Inevitably fail or discontinue their present occupations to the great loss of the Publick Revenue as well as other Publick convenience and which will Inevitably destroy the Markets and of course the Business and Trade of the Town." "We desire to represent to you that Guildford is a situation which must necessarily be filled with Troops in time of War and Invasion. The erection of Publick Ovens for Troops contiguous to the said Town and Established for three years proves the above Assertion. Guildford is the central or halfway Quarters between the Metropolis and Portsmouth and also between Chatham and Portsmouth .... And consequently can seldom if ever be free from being the settled quarters of some troops. At the same time it is the constant Halting Place of all Troops going to and returning from Foreign Parts. It is also the constant Halting place of all sick and wounded Soldiers and Seamen their wives and children .....It is also the constant Halting Place of at least Nine out of Ten of the recruiting parties going out of or coming into this island which from the vast increase of the Army and Navy has made the burthen almost Tenfold upon this Town. The relief we mean to point out is to apply to the Legislature for the fitting of proper Barracks for the reception of Troops Destined for settled quarters in this place. Barracks are conveniences known to many parts of this Island and we trust that we have already sufficiently shown that no situation in Great Britain requires them more than Guildford. 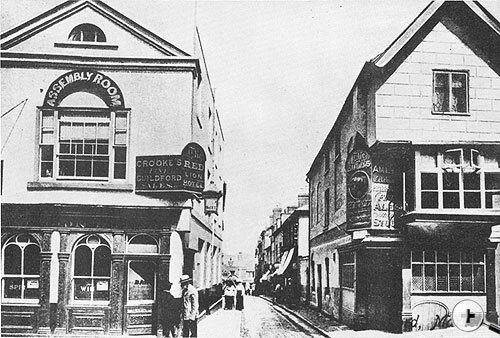 The vast number of troops that have been quartered in Guildford within three years has produced such fatal effects that more Publicans have failed within that small period than for thirty years before." A list was added to this petition of the inns whose keepers had gone bankrupt. They were The White Horse, Ram, Bell, White Hart, Tunns, Bull Head, Angel, Jolley Butcher, Star, White Lyon, Anchor, Row Barge and the Red Lion at Stoke. 13 out of a total of 27 inns then established in Guildford and Stoke. This reasoned petition produced no result and no barracks were built in Guildford for another 15 years. The fact was that a standing army was so unpopular that Parliament preferred to continue to billet on inns, to put canvas whatever the time of year, or to stowaway in barns. General Wade in 1740 said, 'The people of this kingdom have been taught to associate the ideas of barracks, and slavery, like darkness and the devil.' The great 18th century lawyer Blackstone in 1765 wrote that 'soldiers should live intermixed with the people and that no separate camp, no barracks, no inland fortress should be allowed.' It was considered that any Minister of the Crown who proposed the erection of barracks would be ruined.